If the engine hasn’t been working for a long time, you may hear typical sounds (repeated clatter) by operation of hydraulic lifters by the first start of the engine. In case if the engine is functioning, such sounds disappear after the engine warms up, but malfunctioning hydraulic lifters continue knocking. Such strange sounds can be caused by jet contamination and/or wear of hydraulic lifters. It is important to clean the assembly first as it can help to identify the reason of knocking. If the sound is caused by contamination, knocking will stop after jet cleaning. If the hydraulic lifters are worn, the sound can be eliminated by increasing the viscosity of oil or replacing it by a thicker one. More viscous oil will help to seal the clearances. 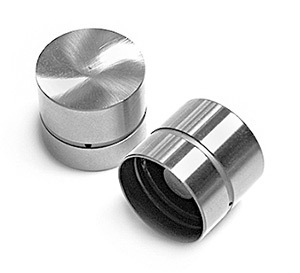 In case of severe wear of hydraulic lifters, they need to be replaced. In order to clean the hydraulic lifter jets, it is advised to add VitaFlush - oil system cleaner into the motor oil (124 to 620 miles of run). 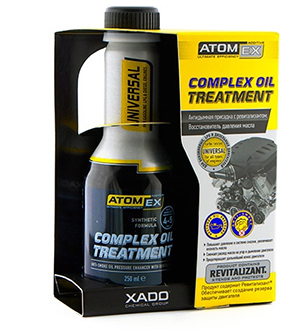 Use Atomex Complex oil treatment, an anti-smoke additive with Revitalizant, to increase the oil viscosity. You can also use the oil with increased high-temperature viscosity. For example, you can replace the oil SAE 5W-40 with the oil SAE 5W-50. Atomex Complex oil treatment is a fully synthetic product that is represented by the polymer thickener, which increases viscosity of oil and contains Revitalizant. The product is compatible with all types of motor oil and safe for turbocharging assemblies. It is applied both in gasoline and diesel engines. Introduce the product, warmed up to the temperature of +25…30 °C, into the oil filler neck of the engine, warmed up to the working temperature. Provide idle engine operation during 2-3 minutes. Drive the automobile as usual. One time application is recommended for the whole service life of the oil. The experience shows that application of AtomEX Total Engine Flush, which has soft washing properties, allows to decrease knocking of hydraulic lifters.